As a business owner, it’s important to stay up to date with new technology that can help you run things more efficiently and securely. This is especially true when it comes to payments. And right now, it’s mobile payments like Apple Pay that should be on your radar. Here’s an overview of how to accept Apple Pay when you’re selling at your brick-and-mortar or offline — and why that’s a smart move. Apple Pay is Apple’s mobile wallet. In stores, the app allows you to pay by holding your iPhone over a payments reader that can accept Apple Pay. If you’ve been to large retailers like Whole Foods or Walgreens recently (or visited a small business that has Square’s contactless and chip reader), you may have noticed Apple Pay in action. It’s super secure. Apple Pay uses sophisticated technology to encrypt and protect every transaction. Card numbers are never actually stored. Instead, Apple assigns something called a Device Account Number to each added card, which is essentially a code name for that card. That Device Account Number is then encrypted and stored securely in a dedicated chip in the device. It’s fast. Apple Pay transactions take just seconds. They’re faster than magnetic-stripe card transactions, and leagues faster than chip card (EMV) transactions, which are especially sluggish. The adoption of EMV as the standard for credit card processing, in fact, may be what accelerates the adoption of Apple Pay in the United States. When customers (and merchants, for that matter) realize how long EMV transactions take, Apple Pay may become the preferred form of payment. It’s convenient. Because it’s all through your mobile device (which you probably have with you all the time anyway), using Apple Pay means that you don’t have to carry around a wallet stuffed-to-the-brim. And if you leave your wallet at home, you won’t be left without a way to pay for things. If you accept offline payments (at your brick and mortar, or at fairs, markets or pop-up shops), it makes sense to start accepting Apple Pay. To do so, you need to implement a POS that’s equipped with NFC technology, which stands for near field communication. NFC is a technology by which two devices (like a payments terminal and a phone) can talk to each other wirelessly when they are close together. This may sound complicated (and expensive), but it’s not. Square’s contactless and chip reader plugs right into your mobile device and is just $49. And if you sell with Square’s POS, you can even sync your Ecwid store to your Square account, making selling online and in-person a breeze. 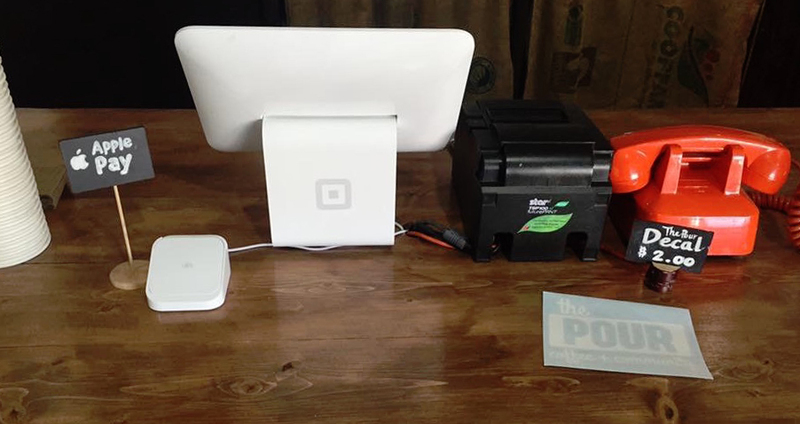 Once you’re all set up, it’s a good idea to let customers know that they can now pay via Apple Pay. The easiest way to do this is with some signage on your countertop. Apple has a kit that lets you download things like register decals. Or you could get creative and make your own sign. You also want to make sure that you put the reader in a good spot. The ideal place is halfway between you and customers. That way, they can hold up their mobile devices to pay. With the Square contactless and chip reader, you’ll be up and running with mobile payments in no time — offering the best possible checkout experience for your customers.